How to use content in small business marketing is a common question. It used to be that local small business would rely on word of mouth, print and yellow page advertising to ensure a steady stream of customer awareness, traffic and sales. Then many small business owners took the step to at least have a website brochure about their business out of the pressures from their customers, but they didn’t invest time or effort in expanding their digital marketing content footprint with fresh consistent content. 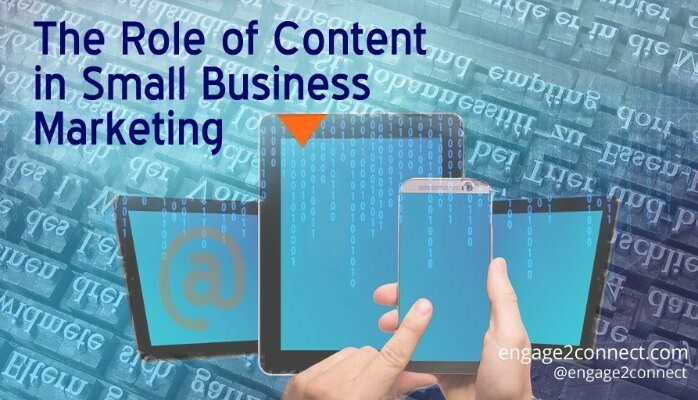 As we fast forward to today, many small business owners are slowly beginning to realize that what they have been doing is no longer working, yet struggle to understand content, consumer internet use and digital marketing, and more importantly how small business content plays an important role today. As small business digital marketing changed, took over and left many reliant on old school marketing with diminishing returns, the data on consumer activity changed right along with it. New research shows that now people equally discover local businesses via word of mouth AND online research. In fact the Vistaprint study reports that 36% of local customers find small businesses online and 37% say they do it through referral from others. Content is what people find when researching online for a local business. Small business content consists of not just a business website brochure, but a well designed website that has the information, articles, relevant stories and graphics that are directly related to what they are searching for. In fact, 34% of people said they won’t even shop with a small business that doesn’t have a website and almost HALF said they won’t buy from one that has a poorly designed small business website! Small business content is the leveler between you and your biggest competitors, if and only if you understand the content role within marketing to local customers. Your small business website has to provide the basic information such as location, hours and product information, but also be something that integrates within a complete multi-channel marketing program. That means your site contains more than things about you, but focuses new content, pictures and articles that address the interests, needs and concerns of your customers and says “we understand you and care”. The role of content for small business is not only an important one, but serves many broad functions within marketing, which are much wider than you might think. Here are some of the key roles that content marketing play in your small business marketing efforts. There are two distinct types of roles that content has within small business marketing. The first are soft roles. These are the heart and mind functions that content creates within your prospects soul. Though soft roles do not directly drive sales and revenue, they lay the foundation of perception that lead to them. Credibility – When a small business content is created consistently for their intended audience, it establishes credibility. Content that focuses on the needs, interests and challenges facing local customers provides a foundation of value with prospective customers, which over time grows into credible trust. Value – When a local business creates content that consistently provides value, the company itself and the products and services they provide become valuable also. Providing content that delivers value, in return creates value with your customers. When a small business can create a sense of value at the brand level, price becomes a far lesser factor when purchasing decisions are made with that brand. Thought Leadership – Small businesses need to establish their expertise within their space that consumers can rely on. Producing various types of content on a consistent basis does that shows that you know your industry, you know your customers and you understand what they need. Creating content around your industry establishes you and your small business as leaders around the topics that are important to your company and your customers. The “hard” functions that small business content perform are more directly related to leads, sales, traffic and revenue. Hard content roles are directly traceable to measurable results. Search Exposure – If your business has the same website it has had for years and you are not consistently adding, modifying and producing new content that is structured and optimized for organic search, you are missing a huge opportunity. Most small businesses don’t have the resources to compete with their larger competitors in traditional ways, however by creating content that your prospects are searching for enables you to outrank your local competition in niche search categories in ways you just can’t do with a static website. Generating Traffic – An effective content marketing strategy that incorporates multiple content types, on multiple platforms results in traffic to your small business digital properties. Unlike one-on-one conversations and relationship building, content marketing creates inbound traffic that can scale. When small local businesses strategically create content it affects consumer traffic to your website, your store, via telephone and your other digital properties. Additionally, when you are creating your own content consistently and sharing it via social media, you are now driving traffic to YOUR website. Your content drives traffic to you, unlike when you share other people’s content. If your social media marketing consists of sharing other people’s graphics, videos and articles because you are not producing your own professional content, that traffic is going to other websites. Furthermore, when you create content yourself and it is shared by your social connections, you expand your reach and your small business is essentially being introduced to the friends of those who are sharing it. THIS is social media’s version of word of mouth and is incredibly powerful. Sales Funnel – When content your local business creates is utilized effectively, you are able to move visitors through a sales process or through their buying journey. When content on your blog, YouTube channel and other platforms work together, you establish a flow that leads customers to an end result of inquiry, in store visits or online orders. Properly designed and executed content marketing with sales funnels fit with today’s consumers digital and local buying habits, which produces real results. For small business and local business owners to compete today, they need to ensure that their digital marketing is no longer disconnected stale properties that roll the dice on results. There must be a highly strategic and integrated approach that incorporates new content across the digital spectrum on a continual basis. The content that is being created needs to take into account the overarching strategy, goal and intent if it is going to deliver short and long-term small business results that can scale. Though the role of content within small business marketing is extremely complex, we have tried to outline just a few of those functions in ways that are easily absorbed. How can we help you develop a content marketing program that works for your small business?